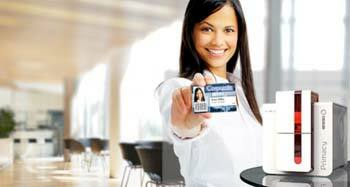 Evolis develops, manufactures and markets a complete range of card printers for personalized plastic cards. This includes personalization options for graphics, magnetic and electronic encoding and transmission (contact or contactless chip cards, also using RFID technology) for all types of cards: badges, student cards, bank cards, etc. Evolis also markets a broad range of products and services for identifying people and goods: software for customizing cards, a complete line of accessories and consumables, as well as signature pads and support services. Based in Angers (France) with subsidiaries in Miami and Boston (United States), Mumbai (India), Singapore and Shanghai (China), Lisbon, Paris and Lyon (France), Evolis is listed in stock exchange and earned sales of ca. 77 million euros in 2016. The Company has more than 350 employees and is represented in 140 countries throughout the world. Using Evolis printing solutions your customers create plastic cards that are completely personalised, encoded with magnetic stripes or chips (as needed) and secured with lamination, to support multifarious applications. Depending on the model, your customers print decentralised on-site, and exactly when the cards are needed – or centralised ahead of time. Either way, the print results are always highly professional.